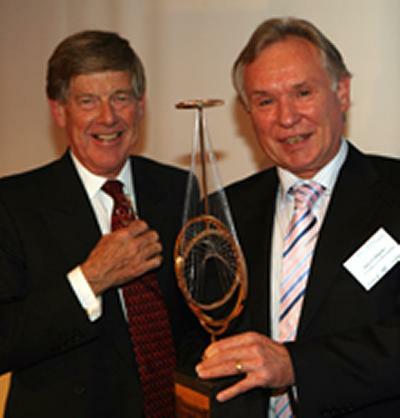 Internationally-distinguished photonics researcher and fibre optic pioneer, Professor David N Payne, Director of the Optoelectronics Research Centre, at the University of Southampton, was presented with the 2008 Marconi Society Prize and Fellowship at the society's annual awards dinner. The event was attended by 150 scientists and other dignitaries at the Royal Society in London on Friday 26 September 2008. Payne was selected for his pioneering work in the field of fibre optoelectronics and fibre telecommunications, the backbone of modern high speed data transmission. Lord Alec Broers, chair of the Science and Technology Committee of the House of Lords, made the presentation of the $100,000 Prize. The Marconi Society, established in 1975, annually recognizes a living scientist whose work has advanced the social, economic and cultural status of all humanity. Of the many and major advances developed by Payne's research group, the best known is the invention of the erbium-doped fibre amplifier (EDFA), a type of optical amplifier on which rests the whole basis of our fibre telecommunications systems. This unique invention overcame the problem of transmitting data over large distances, a process which even when using highly transparent fibre, requires some degree of amplification. Payne, 63, was born in England, but brought up in Africa, and returned to England to attend university. He earned a Bachelor of Science in electrical power engineering at the University of Southampton in 1967 and became that institution's first graduate student in the new optoelectronics research program. His work helped establish the Optoelectronics Research Centre as one of the leading fibre optic research facilities in the world and he joined the faculty as a professor of photonics, a position he has held for 40 years. He became Director of the ORC in 1995. Says Payne: "I was incredibly fortunate to be offered the opportunity to work as one of the first in optical telecommunications. It created the high-speed connected world and its outstanding success has been one of man's greatest achievements. Without optical fibres and amplifiers it is hard to imagine the internet we know today." Among the numerous awards and honours Payne has received are the top American, European and Japanese prizes in photonics. He has been honoured with the UK Rank Prize for Optics, the IEEE Photonics Award (the first awarded outside the USA) and more recently he was elected to the Russian Academy of Sciences as one of only 240 foreign members. Earlier this year, he also received the Millennium Prize. Payne, a Fellow of the Royal Society and of the Royal Academy of Engineering, lives with his wife Vanessa in Hamble, Southampton. Other recent winners have included Google founders Sergey Brin and Larry Page and French Professor Claude Berrou, whose discovery of turbo codes led to important advances in mobile telephony, satellite and radio communications. The UK has produced a number of Marconi Fellows over the three decades the organization has been in existence, including E. Colin Cherry (now deceased), who laid out most of the foundation of modern information theory; Sir Tim Berners-Lee, inventor of the World Wide Web; Sir Arthur Clarke, widely known as an author but also the first to describe in detail the great potential and technical requirements for using geostationary satellites in global communications; and Sir Eric Ash, a pioneer in the development of Surface Acoustic Wave devices. The Marconi Society at Columbia University was established in 1974 through an endowment set up by Gioia Marconi Braga, daughter of Guglielmo Marconi, the Nobel laureate who invented radio (wireless telegraphy). It is best known for the Marconi Prize, awarded annually to an outstanding individual whose scope of work and influence emulate the principle of "creativity in service to humanity" that inspired Marconi. Through symposia, conferences, forums and publications, the Marconi Society promotes awareness of major innovations in communication theory, technology and applications with particular attention to understanding how they change and benefit society.